The race is on for the next Texas Attorney General. Early voting has already begun and it lasts until February 28th. The Texas Republican Primary Election Day is March 4th, 2014. One Texas Attorney General candidate, Barry Smitherman, stands out above the rest. The Texas Attorney General’s office is one of the largest statewide offices in Texas. As the Chairman of the Texas Railroad Commission, and the former head of Public utilities, Barry Smitherman is the only candidate that has proven he can effectively and efficiently run a large statewide agency. Smitherman has proven himself to be the best social conservative in this race, having garnered the endorsements of BOTH pro-life groups in Texas. He was even endorsed by David Barton. Smitherman has also proven himself to be the best fiscal conservative in this race. While his opponents were raising their own office budgets, Smitherman was voting against any increases in his office budget. Smitherman even saved Texas taxpayers millions of dollars over the years. Smitherman is even the only candidate in this race to ever get an A+ rating from the NRA (2012) and he currently has an A rating. Smitherman is a strong defender of the Second Amendment. He fought for and won the right of his field workers to be able to carry a gun for protection and he is the only candidate with a Concealed Handgun license, so he is not just talk! 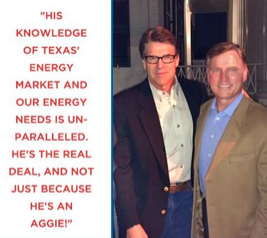 What Does Governor Rick Perry Say About Barry Smitherman? One of the most important things that Texas Attorney General Greg Abbott has done is sue Obama and defend Texas from Obama. Smitherman has sued Obama 7 times already! In fact, while Smitherman was suing Obama, the business of at least one of his opponents was taking in hundreds of thousands of dollars in Obama stimulus money. Fighting For Us from Barry Smitherman on Vimeo. Above is a picture of Ted Cruz and Barry Smitherman. 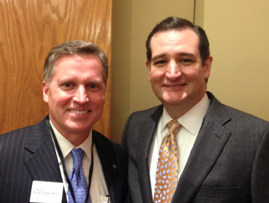 I fought to help get Ted Cruz elected because I knew he was the best conservative fighter for the job. I also believe that Barry Smitherman is the best conservative fighter for the job of Texas Attorney General.